Jerusafun in Jerusalem: SHABBAT SHALOM! SHABBAT SHALOM FROM THE HOLY LAND! I can't believe I'm here! Seriously, this is one of the coolest places ever. Okay so it started with the flight- from Salt Lake to JFK I made some new friends, so that was nice. Then from JFK to Tel Aviv I was supposed to sleep...I did not get any winks of sleep that flight so that was lovely. But when we landed, I almost didn't make it past the passport guy because I told him I was studying here instead of traveling (which is what we were supposed to say) so he almost didn't let me go...haha but I made it! Then we drove up to the center, which is on the top of a hill and it is SO BEAUTIFUL! Except when we got here it was raining like crazy! So we couldn't see the Old City yet, but now that it has cleared up the view is great! It snowed too! Like 6 inches or something on Wednesday night, so Thursday we woke up to what looked like Provo all over again haha. Then Thursday was full of orientation activities so that was nice, except I kept falling asleep...And today is our first day of class! I'm writing this super early because I couldn't sleep again, the prayer call woke me up this morning (but I like it so it doesn't bother me!). Anyways, here are a few pictures of my life right now, the internet is not so great but I will add more next time, ENJOY! My roomies Tori, India and Chloe! Snowy in J-Town! 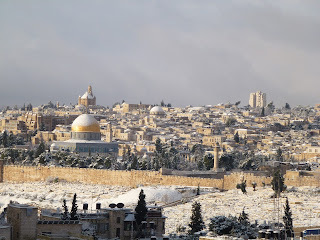 Dome of the Rock with snow on top! I bought a skirt at DI...and my roommate India found the matching shirt! Sunday outfit next week? Check! YAY FOR YOUR BLOG! You're so lucky you made it thru security. 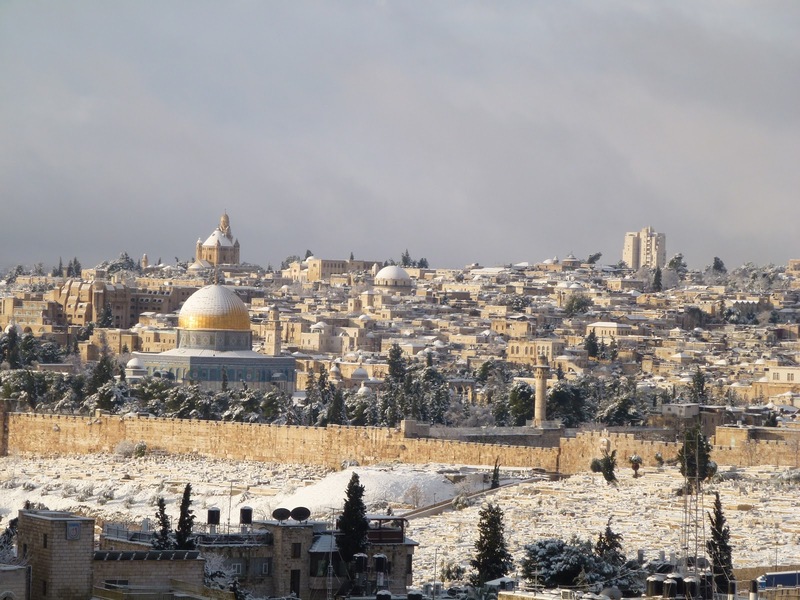 The picture of the Dome of the Rock w/ the snow on top is beautiful. What a gorgeous view you have of the Holy Land. Kara...keep blogging! It's so fun to read of your adventures and you'll love reading it when you get back. LOVE LOVE LOVE LOVE YOU! Oh yeah, be safe and I love you!!!! 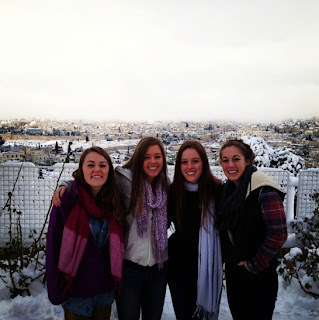 I love seeing you and your roommates and the snow! I am looking forward to reading about and seeing your experiences there in the Holy Land. What an amazing time you will have! 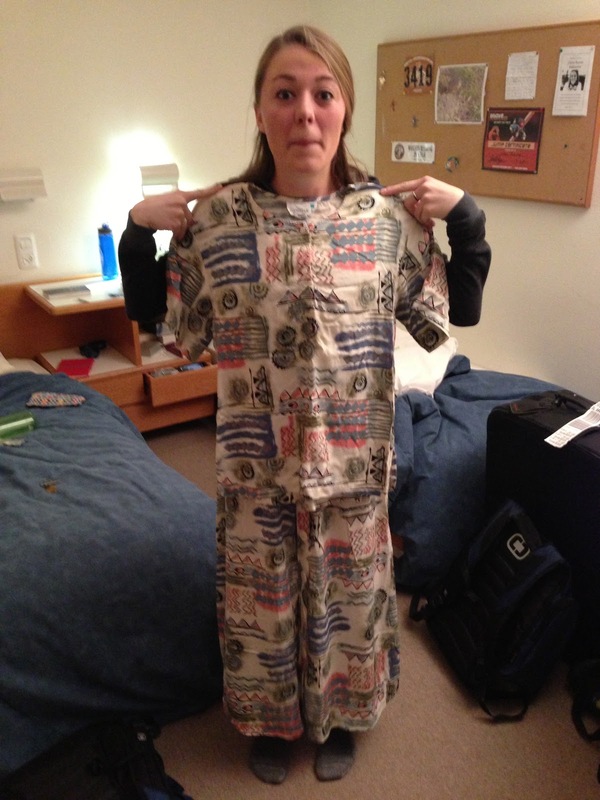 You rock your new Sunday outfit! Lots of love! Ummmmm holy crazy matching outfits???!?!? Seriously?? That is completely nuts. Crazy like snow in Jtown, or barely making it through customs! Cray-Cray. Love you! Hey, Kara!! This is Sister P. and I am going to follow your blog!! What an exciting time for you!